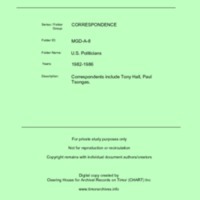 Correspondents include Tony Hall, Paul Tsongas. “U.S. Politicians [MGD A8],” CHART DIGITAL, accessed April 18, 2019, http://chart-digital.info/items/show/618.